The House of Commons has voted 153-120 to strip the Canadian Wheat Board of its monopoly on western wheat and barley. The House of Commons has voted to strip the Canadian Wheat Board of its monopoly on western wheat and barley. The House, led by the majority Conservatives, voted 153-120 on Monday evening to support a bill that ends the board's control. The bill now moves to the Senate, where it will face three rounds of votes, plus committee examination, before it becomes law. Agriculture Minister Gerry Ritz spoke ahead of the House vote, accompanied by Saskatchewan Agriculture Minister Bob Bjornerud and Alberta Agriculture Minister Evan Berger. 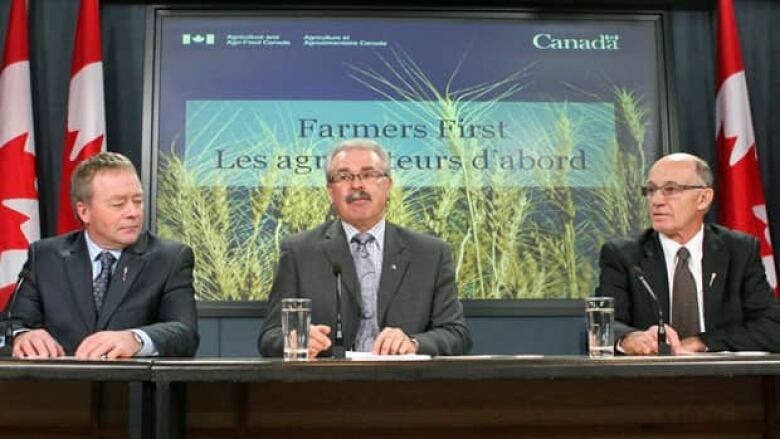 Berger and Bjornerud hailed Monday as a historic day and praised the federal Conservatives for promising to end the wheat board's monopoly before they were elected. They said they expect to see more investment in their provinces once the legislation takes effect. Berger said he expects rural reinvigoration, including a new generation of young farmers. "The ultimate property right is what you do with your production, whether it be intellectual or physical. I believe we are giving back a property right, a freedom of choice, to farmers who make large investments, who have the wherewithal to sell their grain to whomever, whenever, at what price they see fit," he said. While ministers from two of the three Prairie provinces were at the news conference, Manitoba's Agriculture Minister Stan Struthers wasn't. He wasn't included on a news release the ministers put out along with British Columbia Agriculture Minister Don McRae. Ritz said Struthers wasn't invited. "Mr. Struthers and his government continue to be mired in the past," he said. Canadian Wheat Board supporters mounted an in-person push in Ottawa Monday hours before MPs were due to vote for the final time on a bill to eliminate the board's monopoly. Protesters from the National Farmers Union, a former wheat board chairman and a former director staked out Ritz's press conference, yelling at him as he left the building. Wheat board supporters say if the agriculture ministers are so confident that farmers back them, they should hold a binding vote before making any changes. Farmers voted last summer in favour of keeping the wheat board a monopoly in a plebiscite Ritz has referred to as an expensive survey. "If he believed the farmers want this, he'd let us vote on it," Ian McCreary, a farmer from Saskatchewan and a former wheat board director. "They're allowing no input, they have received no professional analysis from their departments, and I'm here to say slow down. I'm here to say allow us to vote. I'm here to say do some business cases. That's what I'm here to say."